The other week when I was out of money and food with only $4 to my name, I popped into the farmer’s market that convenes every Tuesday on Emory’s campus to see what I could grab for a few bucks. 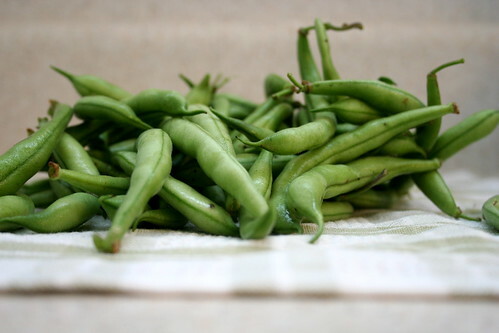 For $3 I grabbed a bunch of green beans from one of the farms, walked home, and then tried to figure out what I could make with green beans and one onion and the staples in my pantry. A stir-fry made sense, so I boiled some rice, sauteed the onion with garlic, added the beans, and then topped with Hoisin sauce mix. It was pretty tasty, and somehow even better the longer it sat in my fridge. The sauce was pretty good. A bit too salty for my taste, but maybe that’s just how hoisin is? I had a bottle in my pantry that I’d picked up from the market a few months ago and this was the first time I used it. So if you have a few veggies sitting around in your fridge that you need to use up, I would recommend this recipe. It’s simple, tasty, and would work with any summer squash, green beans, tofu, broccoli, etc. Saute the onion for seven minutes (or until soft) in a large wok with 1-2 tablespoons of vegetable oil. Add the garlic, saute for one or two more minutes. Add the green beans, saute till tender, approx. 10 minutes. Meanwhile, mix the hoisin sauce, rice wine, seaseme oil, and tamari in a bowl. When the beans are soft, pour the sauce on top. Saute for one minute. What a great, inexpensive dish!! Yum!! Yeah, hoisin is definitely salty. Looks delicious, and then you throw in that it only cost $3 and I’m totally impressed! Go ingenuity! I know from experience how exhausting it can be if you always have to watch how much you can spend…but on the other hand it makes one very creative, right? I love your green been idea! Green beans are one of the few veggies that I am just not a fan of… But I bet you could still get me to try these, because that glaze sounds wonderful. It sounds absolutely yummy! Love hoisin sauce. From your photo it looks like you used Black Bean Paste and not Hoisin. 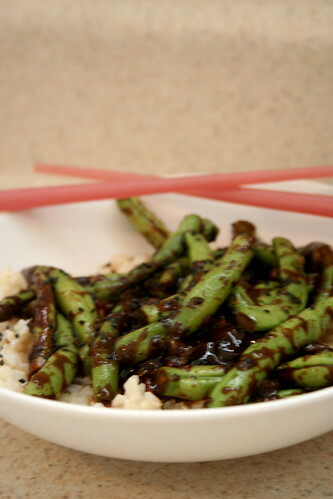 Black bean sauce/paste is VERY salty, while Hoisin has a sweet licorice taste. Definitely Hoisin, or so says the bottle. And yes, black bean sauce is super salty, which is why I was surprised the Hoisin was salty as well. Still tasty though!